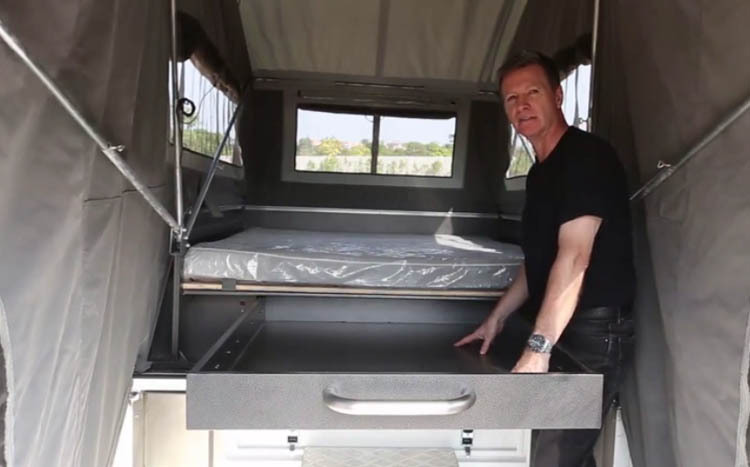 Today, we would like to show you our Rear Hard Floor camping trailer. It’s really easy to set up and we will show you more details on how to set up the camping trailer. 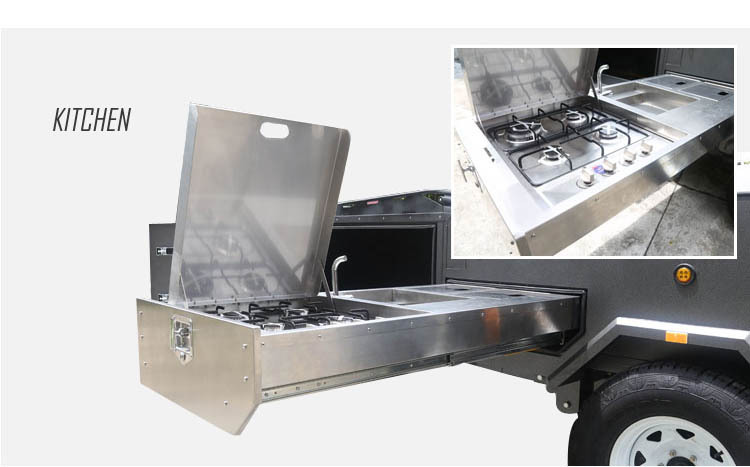 Here is the kitchen located, the kitchen is made of stainless steel, has four burners for cooking, we have foldable tap and sink with running water and here has some storage compartments for whatever you like and your need for cooking. At the front left of the trailer, it has another storage apartment, inside it has light and large drawer and you can store many things. It has space for up to 40 liter fridge. 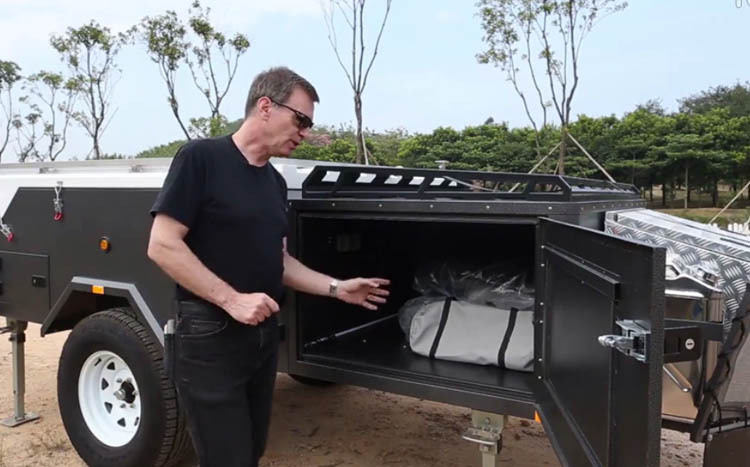 At the front right hand side of trailer, it’s another compartment, it’s 500 liter, so you can store many different type of camping equipments you think you might live with you. 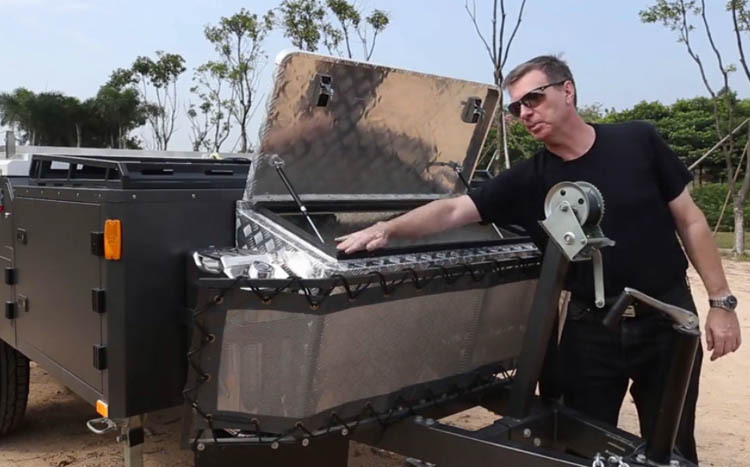 At the front of the trailer, it has a storage box, which is made from aluminum, it has gas system rob to help you lift them up. It’s completely waterproof and many things you can put it in your camping. Here, you have front fender to protect the box and the gas bottle. One front right hand side, you get jerry can bracket holding the jerry can firmly in place, jerry can is 20 liter and made from stainless steel. So before disconnecting the vehicle from the trailer, make sure you set the jockey wheel here and disconnect the coupling, remove the safety chain and don’t forget to remove the electrical connector. 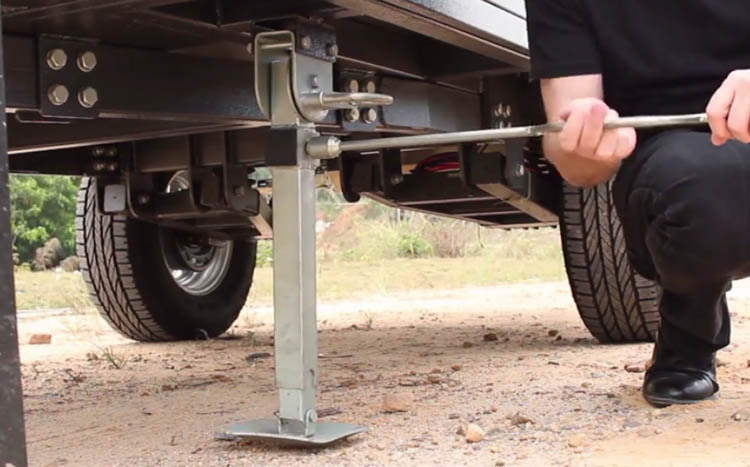 Once disconnecting the vehicle from the trailer, we need to level the trailer to use four stabilizers with three positions, and we will take the hand crank to lower the stabilizers lie firmly to the ground. So once we get the trailer level to make sure the all four stabilizer are firmly down. So the next step is to release the spare wheel, so that we need to move it out of the way. There are two clips, one on the top and one on the nether and we can swing the spare wheel out of the way and the lock ring here to avoid it’s back. The next step is to release some of the holding straps using this switch, we can release the locking clips and need to release the belt about 1.5m of this straps and remember to engage the locking clip. So we need to release the three latches on each side of this trailer. 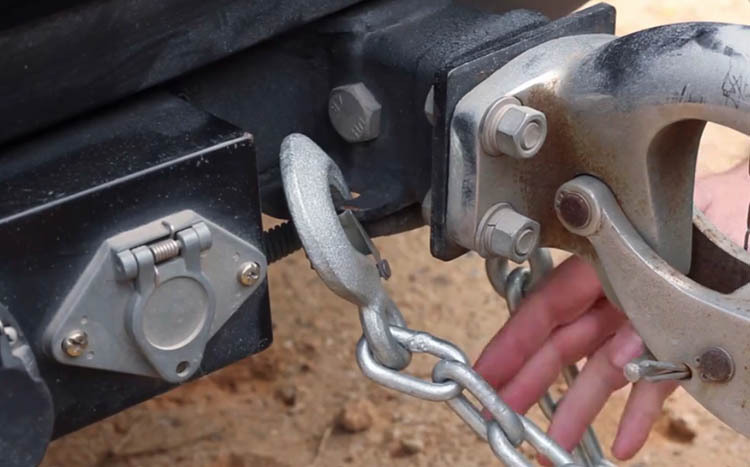 Inside the tent, you need to extend the three hook bolts by pushing firmly on each one, extend and lock them in place. 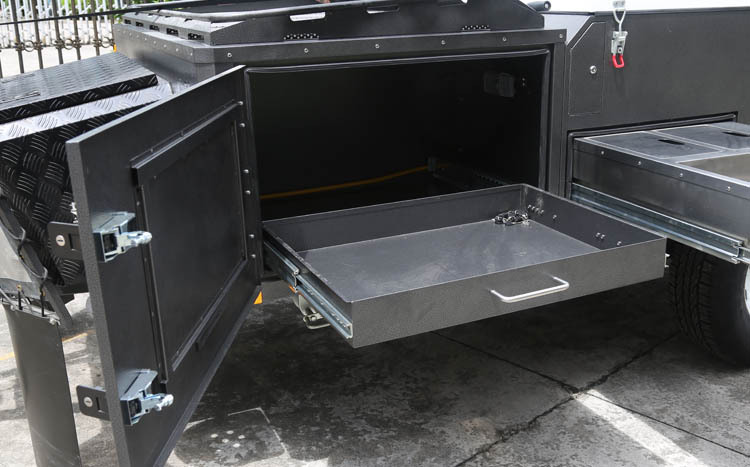 Underneath the double bed, it has large steel storage drawers and you can lock a lot of staff in here. Now we could show you how to set up the tent holding. On the tent, there are three windows and three doors. The trailer tent is completely waterproof and you can enjoy even it rains. 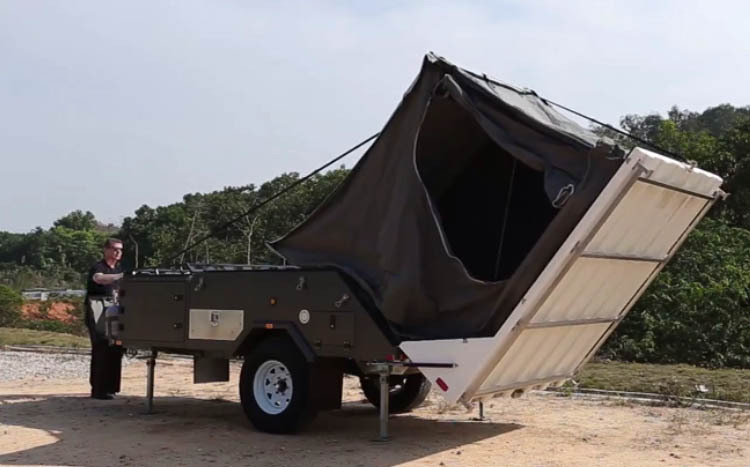 Set your 4wdoverlander camper trailer should be a fun. We think you would able to do it in a very short time. 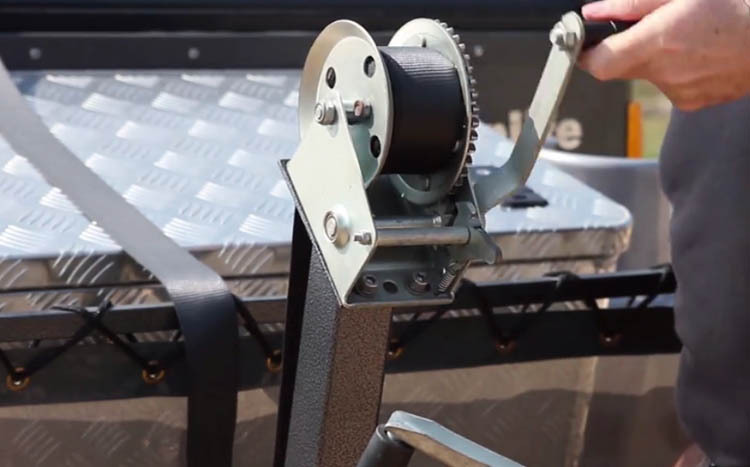 We suggest that before you go on first view on your camping trip, you need to plastic setting up the trailer. I hope you have a lot of fun with 4wdoverlander Rear Hard Floor trailer.